Home/Back Pain, News/Need that extra spring in your step? With longer days and fine weather fast approaching, we want to make sure you’re feeling ready for Spring. We’re now at that time of the year where we’re doing anything from digging out our running shoes, getting back in the saddle, to finally getting stuck into the mess that we call ‘the garden’. However, Spring is notorious for injuries and that’s because many of us start to exercise for the first time in months, with the Winter weather having put a dampener on our fitness (no pun intended). Most commonly, at Physiofusion, we see a huge rise in back injuries during early spring – in particular our lower back. This is because we use our back for almost every movement we make, especially when we exercise. With this in mind, we have put together a guide on how to notice back symptoms early and what you can do to help. Lie flat on your back with knees bent. Keep your feet together and ensure your feet are flat on the floor. Drop your knees to one side to feel a slight twist in to the low back and repeat 10 times to each side. Lie on your back with legs out stretched and bring your leg up to support behind the knee. Slowly straighten your knee to feel a stretch into the back of your thigh muscle. Hold 20-30 seconds and repeat 3 times on each leg. Lie on your back with knees bent and place right foot on the left knee. Place hands around the left knee and pull leg up towards the chest. A stretch should be felt deep into the buttock muscle. Hold 15-30 seconds and repeat 3 times on both sides. Put yourself on your hands and knees. Ensure hands are in line with shoulder and knees in line with hips. Keeping arms straight and push back away, hold 5 seconds and then lower back and arch holding for 2 seconds. Repeat 10 times each way. Lie face down and place hands by your side in line with chest. Push up with arms to arch back. Repeat times 10. Lie face down and lift leg straight up 6 inches off the floor, feel tightening in to the buttock muscles. Hold for 5 seconds and repeat times 10. Lie on your back with knees bent, feet flat on the floor and feet shoulder width apart. Draw your belly button towards the floor and feel a gentle tightening around your lower abdomen. Roll your pelvis to arch your back and hold for 2 seconds, then roll pelvis to flatten back and hold for 5 seconds. Repeat 10 times. Assume the position of pelvic tilting exercise (above) and tighten muscle around the lower abdomen. Roll your pelvis to flatten your back against the floor and tighten your buttock muscles. Peel your pelvis and spine off the floor to lift pelvis so knees, hips and shoulders are in line – hold for 5 seconds and lower slowly. Repeat times 10. Lie on your side with your knees bent to half way and position feet in line with the buttocks. Place hand on pelvis for support and lift the top knee away from the bottom knee keeping feet together. Feel tightening into top of buttock muscle and hold for 5 seconds and lower slowly, repeating 10 times on each side. Stretching should be pain free, so, do not force the body into difficult positions. Move into the stretch slowly and avoid bouncing. This could put strain onto the muscle. Exercise on a clean, flat surface that is large enough to move freely. Hold stretches long enough (20-30 seconds) to allow muscles or joints to become loose. With strengthening exercises ensure you control the movements and take slow deep breaths in and slowly exhale. 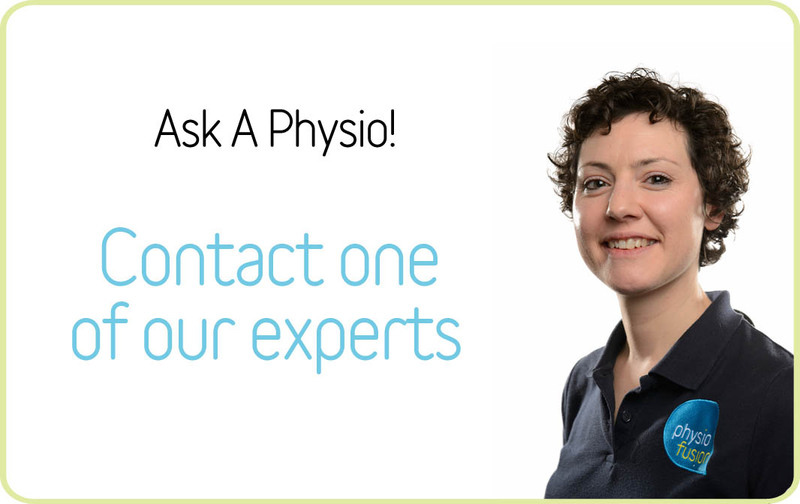 For any questions regarding your back (or any pain you may be in for that matter) talk to our professionally trained Physiotherapists using our FREE online service, Ask-A-Physio or alternatively, you may call us on 01282 453 110.